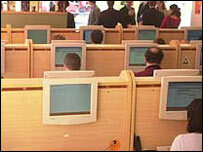 The Easyinternet cafe chain has paid £80,000 to the record industry in an out-of-court settlement over music copyright. The company had earlier been found guilty of copyright infringement for allowing customers to download music from the internet and onto CDs. The British Phonographic Industry (BPI) had taken legal action after learning the company was permitting music copies to be made for a fee of £5. On Wednesday the BPI announced that Easyinternet had agreed to pay it £80,000 in damages for copyright infringement, plus legal costs of £130,000. The BPI praised what it called the "sense" of the company's owner, entrepreneur Stelios Haji-Ioannou - founder of the Easyjet airline. BPI executive chairman Peter Jamieson said: "The irony should not be lost on anyone that someone who aggressively protects their own intellectual property - as is the case with Stelios and the Easy Group - should seek to offer a commercial music service without paying the creators of the copyright." 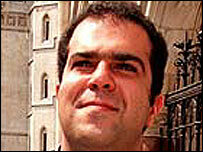 Mr Haji-Ioannou told BBC News Online that the £80,000 settlement fee was far less than the BPI had originally sought. He said it had originally asked for an "extortionate" £1m. "They came back with an attractive offer - a 92% discount on the original claim," he said. "Every case has a settlement value. We could have spent the next year in court arguing the legal point, and that's what I think they got scared of. I'm glad I can move on." He confirmed that his company had dropped its appeal against the judgement made at the High Court in January. He said in hindsight his internet cafe management had been mistaken and "short-sighted" in allowing customers to copy music. During the court case, Easyinternet cafe said it had ceased the commercial service of downloading copy-protected music in September 2001. As a result, it argued it should not be held responsible for what its customers did while using its computers. But judge Justice Peter Smith rejected this defence. Mr Haji-Ioannou said Easyinternet had also put forward the argument that downloading music was no different to recording a favourite television programme to watch later, which is covered by copyright law.